Photograph by Rev. Lisa Beth White. November 2016. The Service of the Longest Night will be in the Chapel at 6 pm. Wednesday, December 21. This is a quiet, meditative worship experience that provides space and time to acknowledge the sadness and concern that may be present even in the midst of the celebration of the season. This service is held on or near the night of the Winter Solstice because, as the longest night of the year, it has the least daylight and the most darkness. 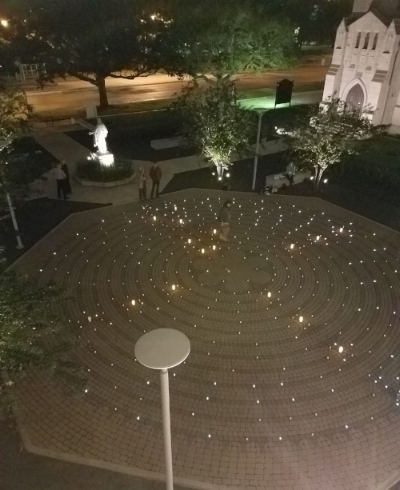 The Labyrinth on the Bankston Green will be lighted for walking in prayer and meditation before or after the service, weather permitting. The Activity Center Labyrinth also will be available. Childcare will be available. To ensure the proper number of childcare workers, RSVP to childcare@stpaulshouston.org.